A friend who recently visited me at home paid me the ultimate compliment upon seeing my window. No, it's not the most picturesque window as my view opens to rows upon rows of neighbor windows and ledges, some neat, quite a lot in various stages of disorder. It's not even the neatest window of the building. "May gubat ka na sa bintana mo!" (Hey, you've got a forest by your window), my friend quipped. It's not an overnight project as I've spent years doing some sort of ledge gardening. And my window and ledge location is far from idea, receiving mostly deflected light for most parts of the day with some fleeting afternoon sun. There are plants I want to grow for food that I couldn't. A lot of herbs don't do well with limited direct sunlight I've read and learned about the hard way. It hasn't stopped me from trying though. I don't buy into the reasoning that because one has very limited space, you can't grow your greens whether they be for eating or for improving your life quality even a little bit. I've even gone into a bit of composting without raising the neighbors' ire for the stink, mainly using banana peels, apple cores, crushed egg shells and discarded coffee grounds from the coffeepress. The internet is a rich trove of information - from sourcing seeds/plants/seedlings to taking care of what you grow. But having to keep hopping from one site to another in search of information made me yearn to assemble my very own ebook where straightforward information can be had and which can be stored in my tablet or iPhone for offline reading/reference. 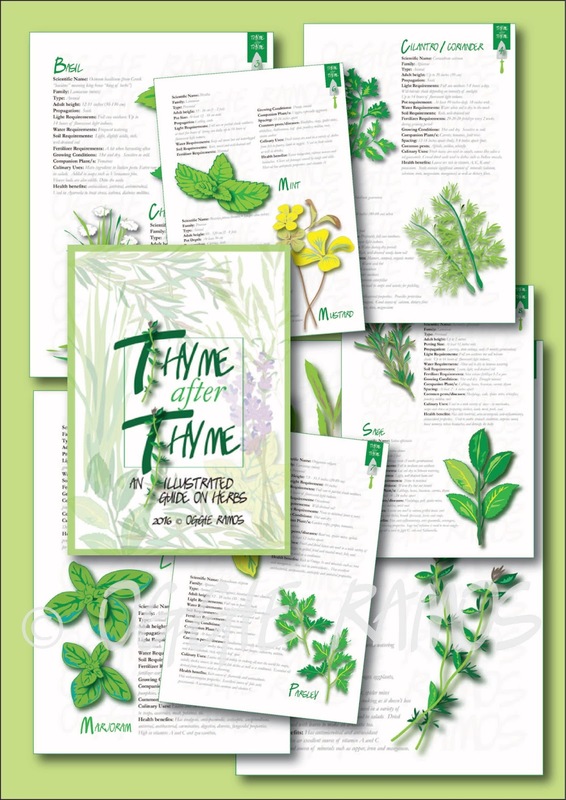 Also wanting something to do with my hands, I married my love of gardening with my humble illustration skills to come up with a no-frills resource I entitled "Thyme After Thyme". While I could probably try to sell the ebook, I thought of sharing this with readers and fellow gardeners. I mean the more of us to get into this habit of growing greens, the better. I know it has taught me some very precious things. Patience, for one. You can't always hasten the growing process especially if you want to do it sans the chemical help. If you're going to eat what you grow, I've learned you have to pay real attention to what goes into it. I know it's a dirty job literally but this connects me to the earth.